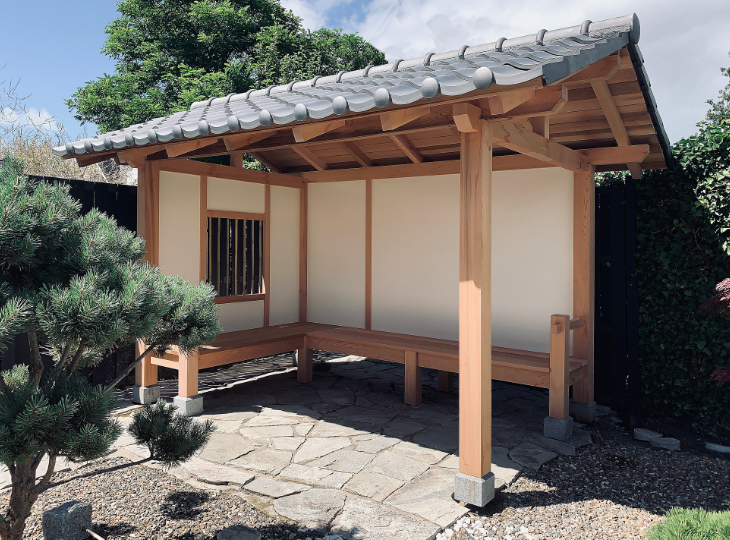 What would be more appealing then a quiet moment of relaxing, sitting in your Japanese garden shelter Yokaze protected from the elements while enjoying your Japanese garden in all its beauty. The traditional Japanese style summer house Yokaze, (Japanese for "night wind") consists of a wooden roof covered bench with side and back walls to protect you from the wind and rain. Every more then average sized traditional Japanese garden should feature a summer house like the Yokaze. The Japanese Koshikake Yokaze comes is 2 different configurations, with one or two side walls. The Yokaze measures 300 x 180 cm. The roof is somewhat bigger and measures 440 x 280 cm. Obviously the Yokaze can also be ordered in a custom design. In that case we can arrange for the technical drawings and presentation of the design in 3D. Note: custom design and presentation require an additional fee. Because of the environmental conditions like sunlight all wood will get a wonderful thin silvergrey top layer. Because Yokoso Japanese Gardens only uses the most durable wood types the decoloration of the wood is not affecting the strength of the construction in any way. However, in case you would like the wood to keep its natural color the Yokaze can be treated with a protecting natural oil. Besides protecting the wood from turning grey the oil will also give the wood a deeper, more outstanding grain. To maintain the natural color of the wood we advise to treat the wood every other year. The Japanses style Yokaze can also be ordered as a kit. In that case the customer will need to put the garden shelter together himself. The customer also needs to take care of the foundation and installment. In case you are considering one of our beautiful Japanese themed garden shelters or garden houses, it is good to know Yokoso Japanese Gardens also provides in transportation and installment on site. For transport and installment on site Yokoso Japanese Gardens will provide a seperate quotation. Costs for transport and installment are highly dependent on you location. The Yokaze garden shelter, (Japanses for night wind), is the perfect shelter to enjoy your Japanese garden even when rain and wind are trying to spoil your day. The roofing can be finished with ironwood shingles or traditional ceramic tiles. The side can also be fitted with a round window. The inside measures 300 x 180 cm. Our modular Japanese structures are made of natural wood. Natural wood will greatly determine the strong natural character of the construction. The various wood types are treated in different ways so that the elements and insects like termites, beetle and woodworm will have no influence on the construction. Over time, however, a natural discoloration can occur. The wood will eventually turn grey which in no way will affect the quality of the wood. If you want to avoid this aging please be sure to treat the wood with a natural oil on regular basis. The foundation of the Koshikake should be determined depending on the location the shelter will be installed. Research into and implementation of the foundation are not included in the base price of the Yokaze. • The garden shelter can be executed in Oregon pine or Western Red Cedar. • The roof can be fitted with ceramic tiles, shingles or planks. • Other adjustments, configurations and dimensions on request.